The difference in fat content between dry-roasted nuts and oil-roasted nuts is really very small. 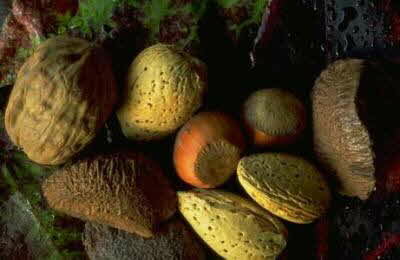 Oil roasted nuts are roasted so fast that they absorb very little of the oil, and then the excess oil is drained off. Store nuts in air tight containers in a cool place (35 degrees F. is best) away from light to prevent them from becoming rancid. Storage: Nuts in the shell store the best, nuts with skins are next, then whole nuts and finally sliced or chopped nuts. Due to their generally high oil content, nuts can turn rancid, so be sure to store in a cool, dry place. Shelled nuts will keep that way for several months, longer in the refrigerator, and up to a year in the freezer. Toasting nuts (and seeds) brings out their flavor and aroma. Toast in a 350 degree F. oven, spread on a baking sheet in a single layer, for about 3 to 5 minutes. Watch carefully because as soon as they start to color they toast very quickly. Remove them from the baking sheet as soon as you take them out of the oven, otherwise they will continue brown. If you want to remove the skins from the nuts, wrap the toasted nuts in a kitchen towel. Let the nuts steam for 5 minutes. Roll the nuts around (while still in towel) until skins rub off.